Hi! Hope everyone had a great weekend! 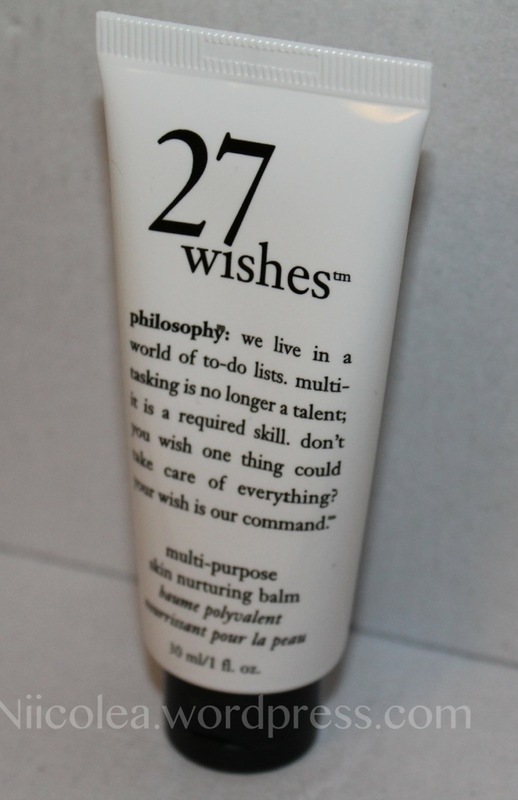 Today I’m reviewing 27 Wishes by Philosophy that came in the mail the other day. This multi-purpose nurturing balm can be used for solving multiple skin concerns such as dry patches on the skin, sunburn or skin irritation. This is my first time trying any products by Philosophy and I am very impressed. My cuticles are usually rough and dry, and after using this balm serveral times the skin is much softer. I love how the thick formula instantly smoothes and moistruizes the skin. If you have stretch marks, cracked heels,dry elbows or knees the unique blend of different natural oils helps to condition and soften the skin as well as give the skin extra dewiness. Have you tried any skin care products by Philosophy? Disclaimer: This product was sent to me for free to do a review, however this does not effect my personal views. This review was all in my honest opinion based on my personal experience. Philosophy is awesome; I love the product line. Yes I need to try some other products by them! Nice, I wonder if I can find one here in Italy. It’s definitely worth to give it a try! I have tried a body lotion and a body wash from philosophy and I liked them! I will have to look into this product as well! Great post! Thanks! I think I might try their body lotion next!